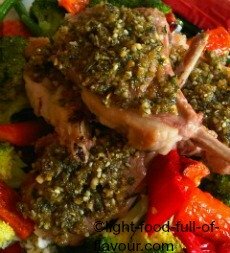 A tasty way to cook lamb chops - herb-crusted lamb chops on a bed of roasted and steamed vegetables. The whole dish puts a big grin on my face. It’s simply delicious! There is of course a bit of fat in the meat. I choose to cook the herb-crusted lamb chops in the oven – which requires no extra fat as I place the chops on baking parchment. It is a healthier way to cook the meat. The herb crust is divine and would be great to use on firm white fish as well. I serve the lamb with lots of vegetables. I’m not going to deny that it can be expensive to buy organic food but when it comes to vegetables, I choose to buy organic varieties as often as possible. Once cooked, I toss the green vegetables in a bit of lemon juice, olive oil, some shredded fresh mint leaves and a bit of salt and pepper. I then crumble some really nice feta cheese (made of sheep’s and goat’s milk – NOT cow’s milk) over all the vegetables. Super-Yum! 1. Pre-heat the oven to 200C/fan 180C/400F/gas mark 6. Place the carrot batons in a roasting tin, drizzle over a bit of oil and toss together. Season with a bit of salt and place the carrots in the oven. The carrots will need about 35 minutes of roasting – give them a stir half-way through and add the peppers (bell peppers) at the same time, coating them in the oil as well. 2. 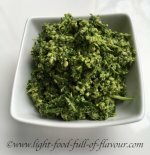 Place all the ingredients for the herb crust in a small food processor and blend together. Place the lamb chops on a baking tray covered with baking parchment. Divide the herb crust over the lamb chops. Cooking time in the oven depends on the thickness of the chops but around 15-18 minutes (I like mine to be pink). Once cooked to your liking – cover the herb-crusted lamb chops and leave them to rest for 5 minutes before serving. 3. Boil or steam the beans, broccoli and peas. Once drained, put them back into the pan and toss with the lemon juice, olive oil, shredded mint leaves and a bit of salt and pepper. I mix all of the vegetables on a large serving plate and add crumbled feta cheese on top of the vegetables, followed by the lamb chops.